Easter is now just around the corner. For readers still looking to purchase chocolate and confectionery Australian Food News has compiled the following amongst the 2016 Easter offerings. 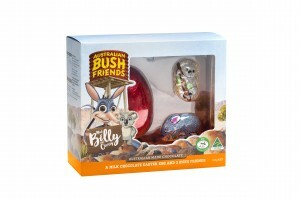 Australian confectionery manufacturer Fyna Foods is seeking to persuade Australian consumers to purchase bilbies and other native animal chocolates this Easter, instead of the traditional chocolate bunnies. Fyna Foods has relaunched its “Australian Bush Friends” chocolate range. For the fourth year running, “up to 30 cents from every sale in the range” will go to the ‘Save the Bilby Fund’, which will go towards preventing the extinction of the native Australian bilby. Australian Bush Friends chocolate includes five characters: Billy the Bilby, Chrissy the Koala, Anna the Kanga, Tom the Frog and Terry the Tasmanian Devil. Fyna Foods owns a number of other Australian confectionery brands including Fads, Wizz Fizz and Big Boss. The company had its start making sherbet in the 1940s. The Fyna Foods chocolates can be purchased from David Jones and Myer department stores across Australia. Cadbury Dairy Milk Humpty Treat-Size Egg: Many Australians are familiar with Cadbury’s traditional ‘Humpty Dumpty’ egg which contains coloured chocolate buttons inside. After selling the ‘Humpty Dumpty’ egg in Australia for over 50 years Cadbury will now be selling a smaller “treat-sized” 25g option. The egg has a recommended retail price of AUD$1.69 and will be available for purchase from January 2016. Cadbury Dairy Milk Hunt Bucket: The Cadbury Dairy Milk Hunt Bucket has been created for those wishing to organise an Easter egg hunt. Each 187g bucket contains 11x17g individual hollow eggs. The bucket will be available from February 2016 and has a recommended retail price of AUD$10.00. Cadbury Mini Egg Jar: Cadbury’s Mini Egg Jar contains six 38.5g mini Easter eggs. The jar comes with a screw top lid and will be available from February 2016 with a recommended retail price of AUD$10.00. Lindor Limited Edition Eggs Bag: In this product Lint’s Lindor balls have been turned into egg shapes. Flavours include coconut, strawberries and cream, milk and dark chocolate. Lindor Stracciatella Eggs: Stracciatella is an Easter Egg with a speckled shell that includes cocoa nibs. The inside is white chocolate. Lindt Easter Hut Bag: A 240g bag of mixed Easter-themed Lindt chocolates ideal for a Easter Egg hunt. Malteasers Teasers Mini Eggs: A 125g packet of mini Easter Eggs which have the Malteasers biscuit pieces throughout. M&M’s Speckled Eggs: A 190g pouch of mini Easter Eggs that have a hard M&M coating with specs on it. The inside is milk chocolate. Mars Mini Eggs: A 125g packet of Mars Bar inspired mini Easter Eggs. Smarties Mini Eggs: Available in a 100g packet, Nestle has altered its Smarties into Easter Egg shapes. Milkybar Mini Eggs: Also available in a 100g packet, Milkybar white chocolate has been turned into small Easter Egg shapes in this offering from Nestle. Smarties Medium Egg: A 100gram milk chocolate wrapped egg with Smarties inside. The egg comes in a cardboard box. An emerging Sydney food company has won the 2017 Telstra NSW New Business Award.